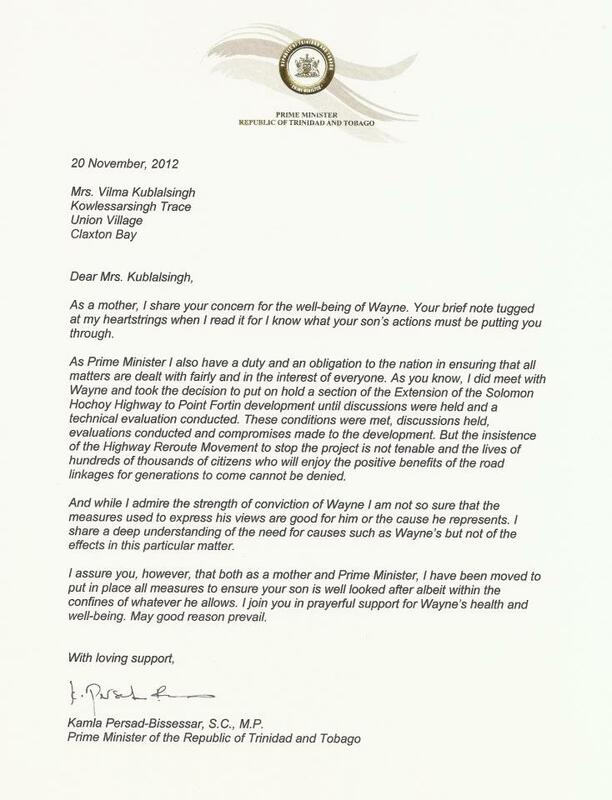 In a move that seeks to upstage the Spoilt Child comment made by Housing Minister Roodal Moonilal, the Prime Minister, the National Mother and Grandmother with Silk, has written a letter to Wayne Kublalsingh's mommy....and has ensured that she pappyshow the letter appropriately by releasing it to the media. Mind you, Mrs Persad-Bissessar's office is just upstairs from where Kublalsingh is holding his hunger strike/vigil. But I guess it would take too much time to take an elevator and go down and speak to Kublalsingh and the protesters in person, the way a real leader would. It was far quicker to just pen the letter and send it off to media houses...thereby ensuring that she stays in the limelight, but outside of the glare of angry citizens. Well played Kamla Rani, well played.